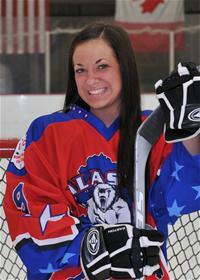 The STU Lady Tommies have added another forward to the ranks for the upcoming 2011-12 season. Brianne Bohn of Wasilla, Alaska has come east to patrol the left wing for St. Thomas. Bohn definitely has some skills and will give the Tommies depth in the foward ranks, something they have been without for the past several years. Coach Murphy had this to say about our new Green and Gold prospect, "She (Bohn) has a great set of wheels and is very dogged and determined on the puck. She will provide excellent depth at forward and will look to help the team on the scoreboard. We are very pleased to have her attending St Thomas." Good luck Brianne and WELCOME!